This post is sponsored by Dr. Praeger’s. Thank you for supporting the brands who keep The Kitchen Paper alive! I know everyone is talking about the eclipse… but … DID YOU GUYS SEE THE ECLIPSE!? Ugh so cool. SO COOL! The hype about traffic in Oregon was completely blown out of proportion, but just in case: we had a biking plan which we executed perfectly. We biked to the MAX (public rail), rode it as far south as we could, then joined the herd of bikers (this is Portland, after all) and headed south for 20 (vv hilly) miles. Once we were firmly in the path of totality, we hung out by a river in a park and waited for 10:15am! ABSOLUTELY WORTH IT. Totality was undeniably amazing and very surreal. What did you guys do for the eclipse? Anything special? 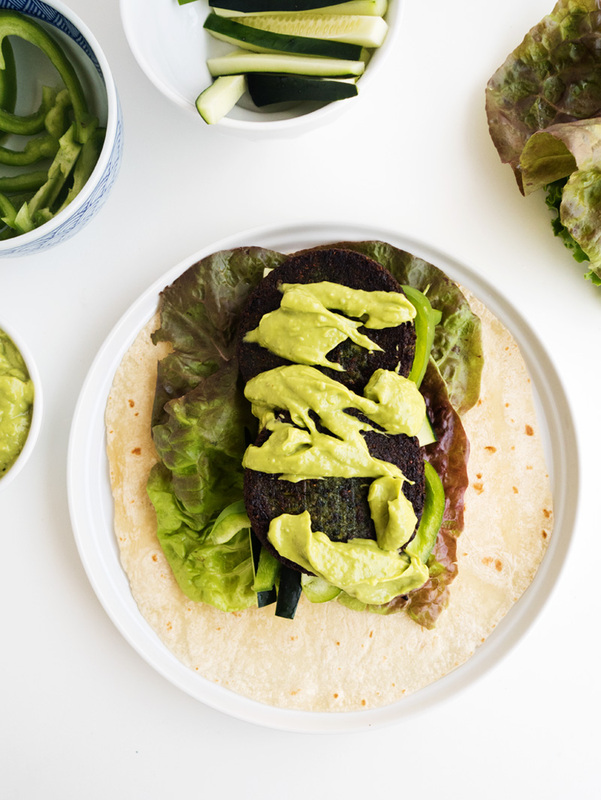 Let’s talk about this wrap — it’s special FO SHO. I started eating Dr. Praeger’s Super Greens Veggie Burger last summer (totally unsponsored and on my own) because you know how I feel about eating all the green things. (Favorably. Very favorably). So when they came to me this year about working together, I was PSYCHED! They have a great story, and an approach to whole foods that I completely admire. Whole foods plus convenience = magic. 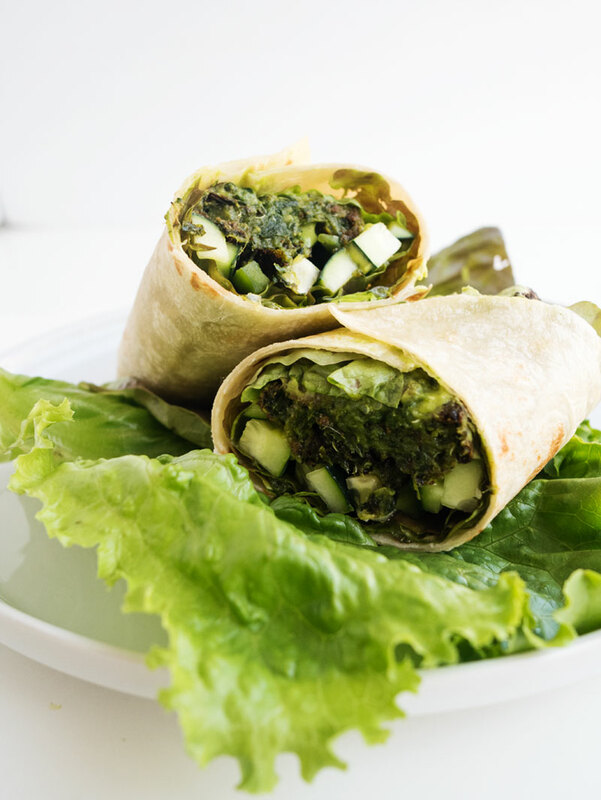 I wanted to keep the green theme going, so I’ve been making this wrap for lunch the last few weeks using all sorts of green veggies — cucumber, jalapeño, sprouts, lettuce, avocado, cilantro, etc. This time of year I’m getting most of that stuff from our garden, so it’s perfect! This recipe is my favorite combo! I’ve discovered that I really love making the avocado into a sauce, usually with some garlic (shhh I know it isn’t green) and jalapeño. 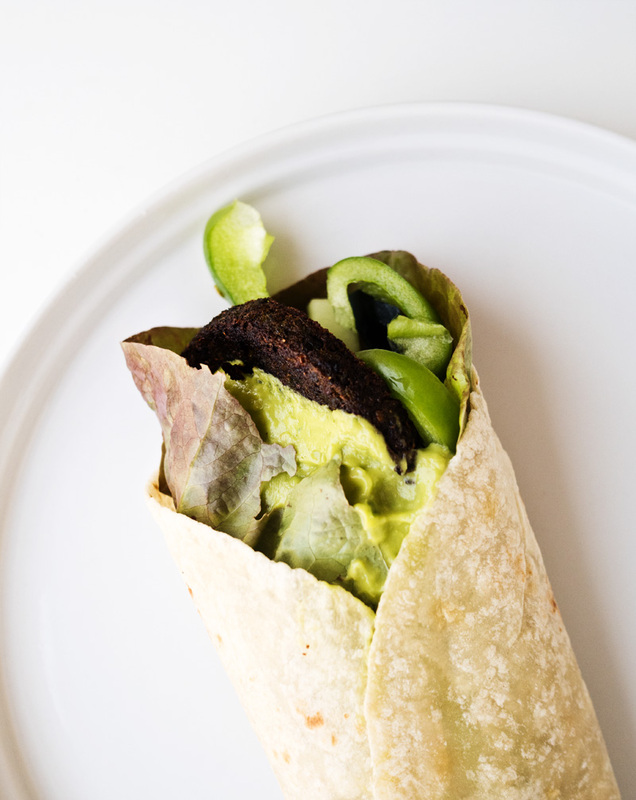 With the sauce, I get a little punch in every bite, rather than having pockets of avocado and pockets of jalapeño. What else would you put in this wrap? Anything else green I’ve totally overlooked!? Any non-green things!? I’ll admit to occasionally putting peanut sauce on this… YUM. 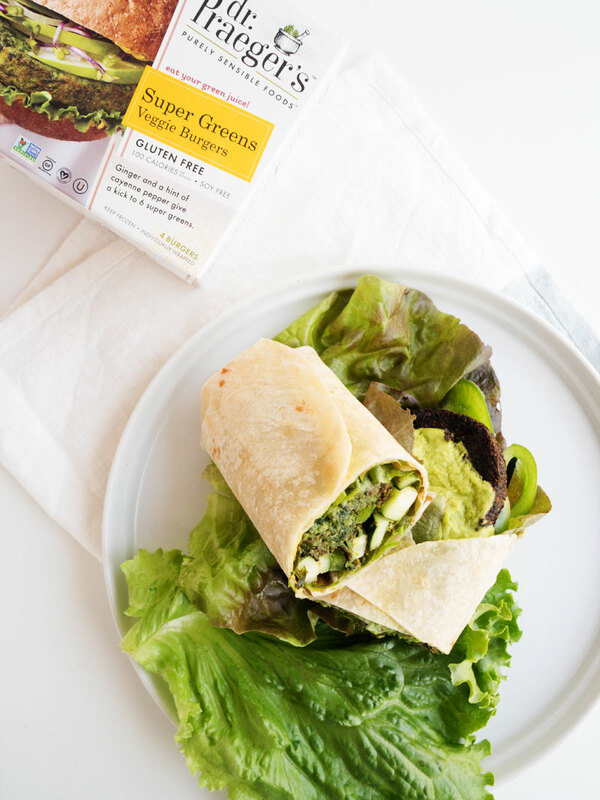 This healthy vegetarian wrap has all green vegetables, avocado, and a Super Greens Veggie Burger from Dr. Praeger’s. First, make the sauce. 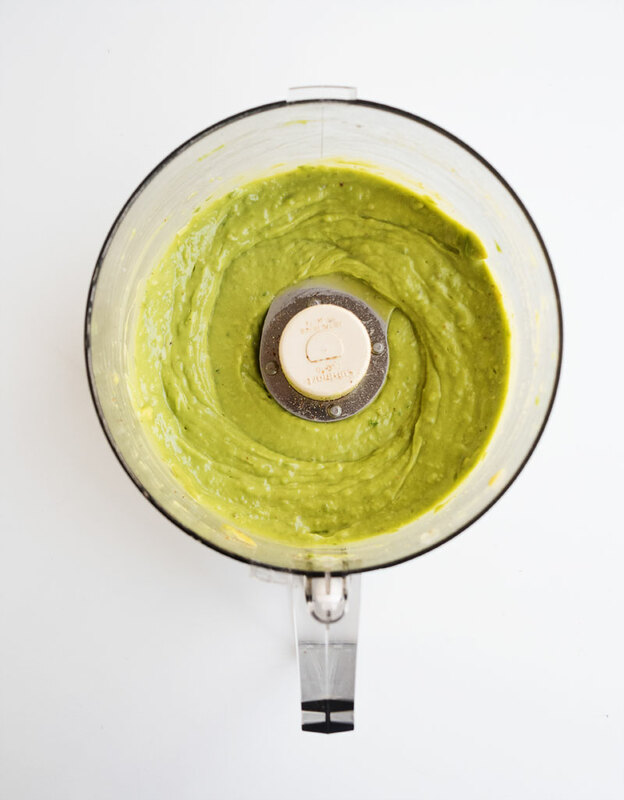 Combine the avocado, cilantro, jalapeño, lemon juice, garlic, water, salt, and pepper in a food processor. Blend until smooth. Next, cook your Dr. Praeger’s Super Greens Veggie Burger(s) according to the directions. I like to cook mine on the stovetop to get the edges crispy! 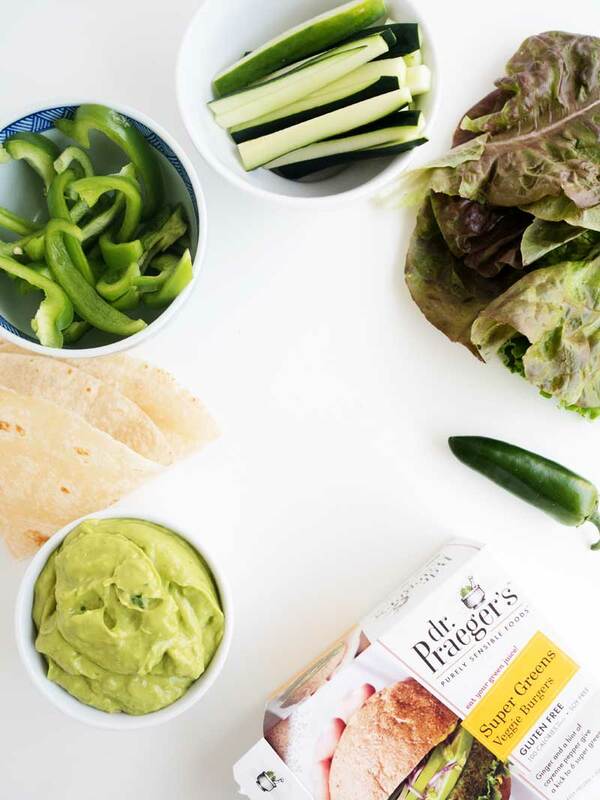 Assemble your wrap by layering the tortilla, lettuce, sliced bell pepper, sliced cucumber, Dr. Praeger’s Super Greens Veggie Burger(s), and topping with your avocado sauce. 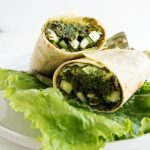 Wrap it all up, and eat!